The cause of pericarditis is unknown or unproven in many cases. It mostly affects men ages 20 to 50 years. You may have fever, chills, or sweating if the condition is caused by an infection. When listening to the heart with a stethoscope, the health care provider can hear a sound called a pericardial rub. The heart sounds may be muffled or distant. There may be other signs of excess fluid in the pericardium (pericardial effusion). The cause of pericarditis should be identified, if possible. High doses of nonsteroidal anti-inflammatory drugs (NSAIDs) such as ibuprofen are often given with a medicine called colchicine. These medicines will decrease your pain and reduce the swelling or inflammation in the sac around your heart. Draining the fluid from the sac. This procedure, called pericardiocentesis, may be done using a needle, which is guided by ultrasound (echocardiography) in most cases. Cutting a small hole (window) in the pericardium (subxiphoid pericardiotomy) to allow the infected fluid to drain into the abdominal cavity. This is done by a surgeon. Surgery called pericardiectomy may be needed if the pericarditis is long-lasting, comes back after treatment, or causes scarring or tightening of the tissue around the heart. The operation involves cutting or removing part of the pericardium. 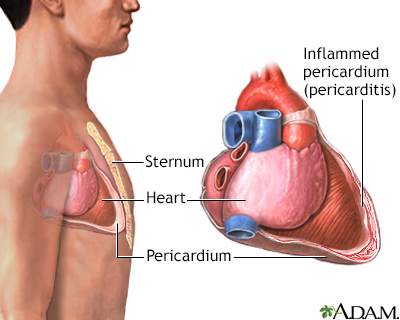 Pericarditis can range from mild illness that gets better on its own, to a life-threatening condition. Fluid buildup around the heart and poor heart function can complicate the disorder. The outcome is good if pericarditis is treated right away. Most people recover in 2 weeks to 3 months. However, pericarditis may come back. This is called recurrent, or chronic, if symptoms or episodes continue. Scarring and thickening of the sac-like covering and the heart muscle may occur when the problem is severe. This is called constrictive pericarditis. It can cause long-term problems similar to those of heart failure. Call your provider if you have symptoms of pericarditis. This disorder is not life threatening most of the time. However, it can be very dangerous if not treated. Many cases cannot be prevented. Imazio M, Gaita F, LeWinter M. Evaluation and treatment of pericarditis: A systematic review. JAMA. 2015; 314(14):1498-1506. PMID: 26461998 www.ncbi.nlm.nih.gov/pubmed/26461998. Knowlton KU, Narezkina A, Savoia MC, Oxman MN. Myocarditis and pericarditis. In: Bennett JE, Dolin R, Blaser MJ, eds. Mandell, Douglas, and Bennett's Principles and Practice of Infectious Diseases, Updated Edition. 8th ed. Philadelphia, PA: Elsevier Saunders; 2015:chap 86.